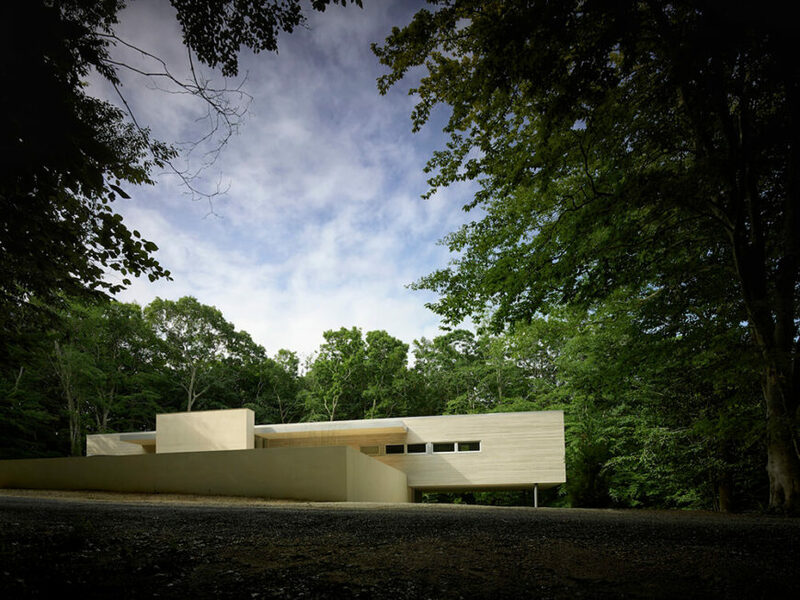 Welcome to our gallery featuring the breathtaking Green Woods House project by Stelle Lomont Rouhani Architects. 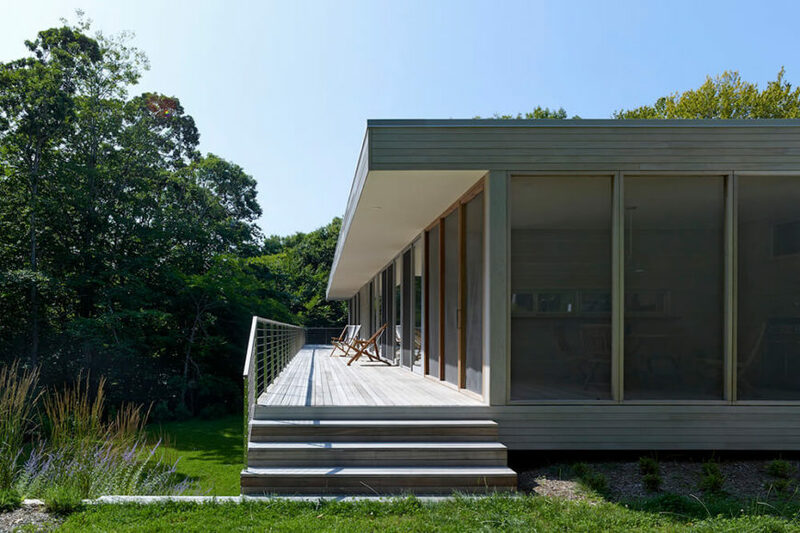 This immaculate modern project was crafted from an existing Acorn house located in the woods of Amagansett, New York. The owners of the original home hired the designers to build a modern residence with deep attention paid to energy use and sustainability. The project was achieved by exploring beyond the edges of conventional building methods. The architects teamed up with ASUL, an Arizona company that specializes in system-based design methodology and using a parts kit for site-built assembly. This collaboration allowed the team to achieve the design specifics at a significantly lower cost. Environmental factors, including a large forest canopy and heavy clay content soil, thwarted the owner’s original hopes of using rooftop solar panels for electricity and a geothermal system for heating and cooling. However, as they say, necessity is the mother of invention. The team was forced to innovate, turning to novel methods for passive energy use. Maximizing the solar orientation of the home, the design integrates passive solar principles into the structure. 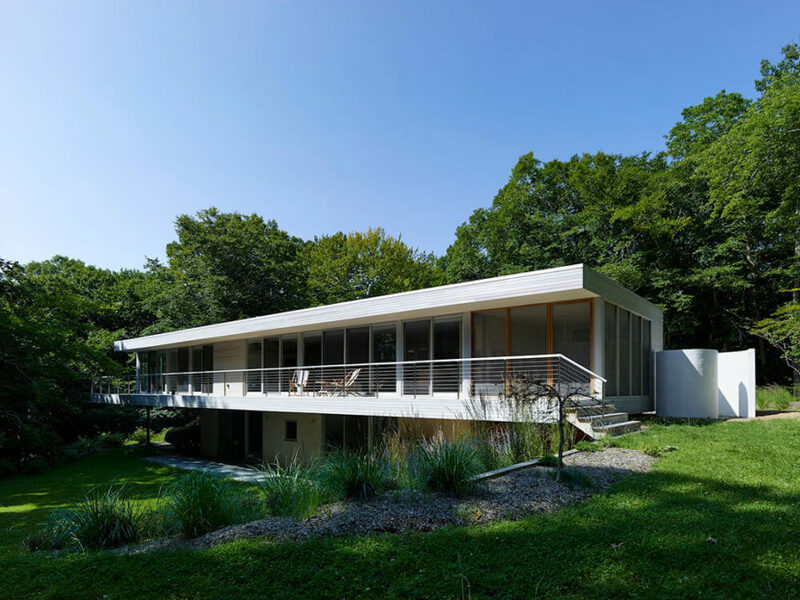 A large overhang and nearby deciduous trees provide naturally cooling shade in the summer, while the low winter sun penetrates the broad expanses of glass for a nice heat gain coefficient. This heats the floor, providing thermal mass. At least one portion of the roof does in fact receive adequate sunlight, and was mounted with solar hot water heating panels. These are part of an elaborate mechanical system that provides radiant heating throughout the home. The north facing exterior of the home is more thickly insulated, dotted with strategically placed openings for natural cross ventilation. This mixture of deep insulation and dynamic air quality helped the house achieve an Energy Star rating. 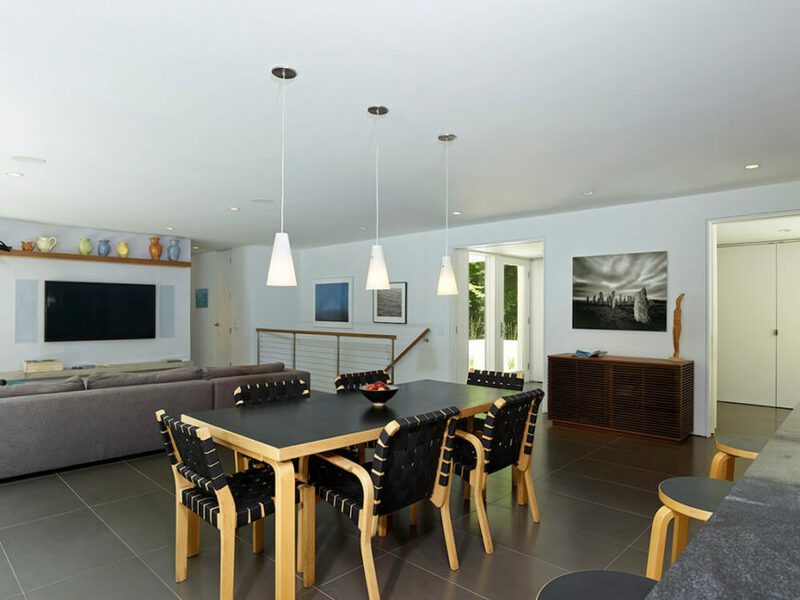 We love the combination of exquisite modern design and environmental compatibility in this home and hope that you enjoy our gallery! The front side of the home is considerably more opaque than the rear. The entry area features a unique spread of floating platforms over a bed of stones, one of many ultra-modern touches. The driveway slopes down beneath the right wing of the home, which conveniently provides parking shelter. 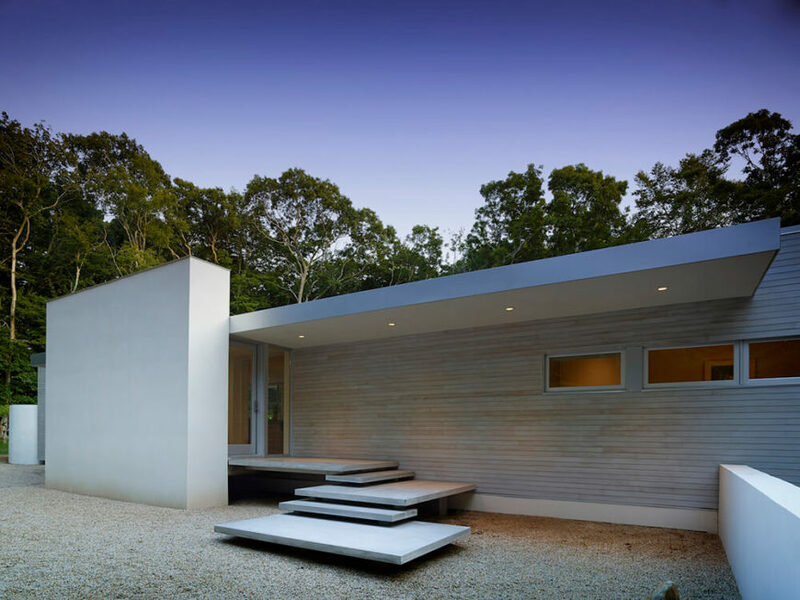 The front of the home is an exercise in minimalism, with broad slabs of white and few windows dotting a monolithic appearance. Pulling back a ways, we’re given the full context of the landscape, filled with a broad treetop canopy but dappled with sunlight. 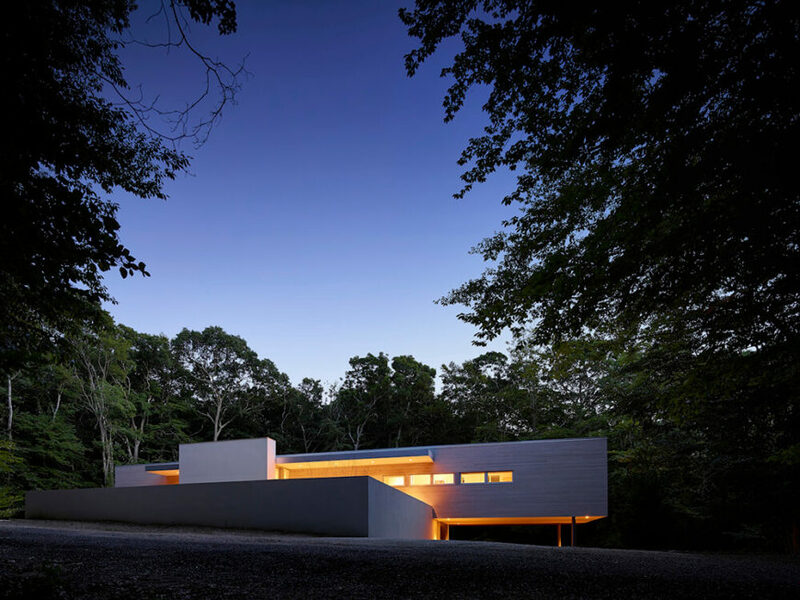 The angular white blocks of the home stand out in sharp contrast. The lengthy deck spans the entire breadth of the home, flanked nearly the entire way by sliding glass panels for access from anywhere within the home. An open plan design means that this central area, including living room, dining, and kitchen spaces, shares a continuous view through the house-wide stretch of glass panels. The living room area centers on a white shag rug, contrasting with the large format grey tile flooring seen throughout the interior. 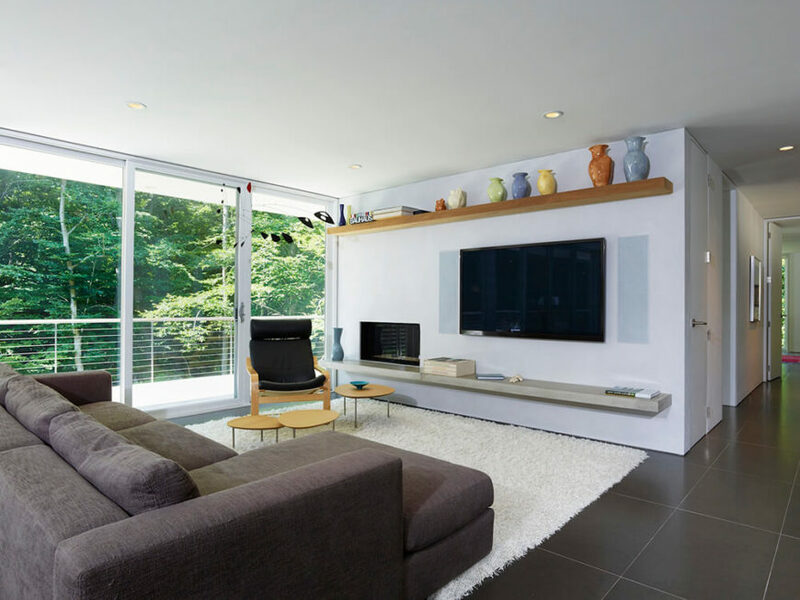 Natural wood and stone shelving bracket the entertainment wall, while modern furniture completes the look. The dining area holds a lengthy natural wood table and set of chairs, upholstered in black with matching black tabletop. Beyond, we see the expansive balcony with the treeline behind it. Across the dining area, we can see the front entry area of the home, as well as the unique decorations dotting the white walls. A set of stairs at center leads to the lower level and driveway access. With the exterior wall being almost 100% glass panels, the home interior glows with warmth and natural light. This passive energy conservation helps the home achieve its Energy Star rating. 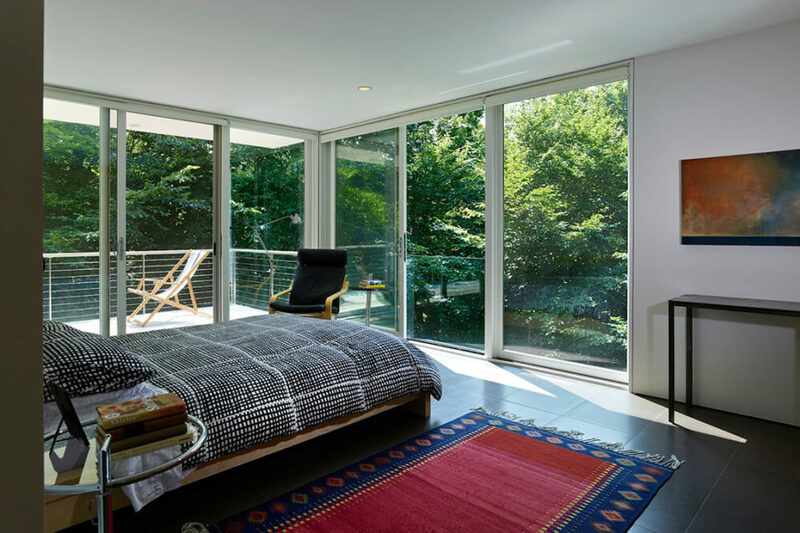 The master bedroom sits in the corner of the home, enjoying broad views of the surrounding nature. A colorful rug and checkered bedding, along with a colorful painting and tastefully selected furniture, helps the area stand out within the minimalist-styled home. Seen from a distance, we can appreciate the bespoke appearance of the white, minimalist home amidst the backdrop of greenery. 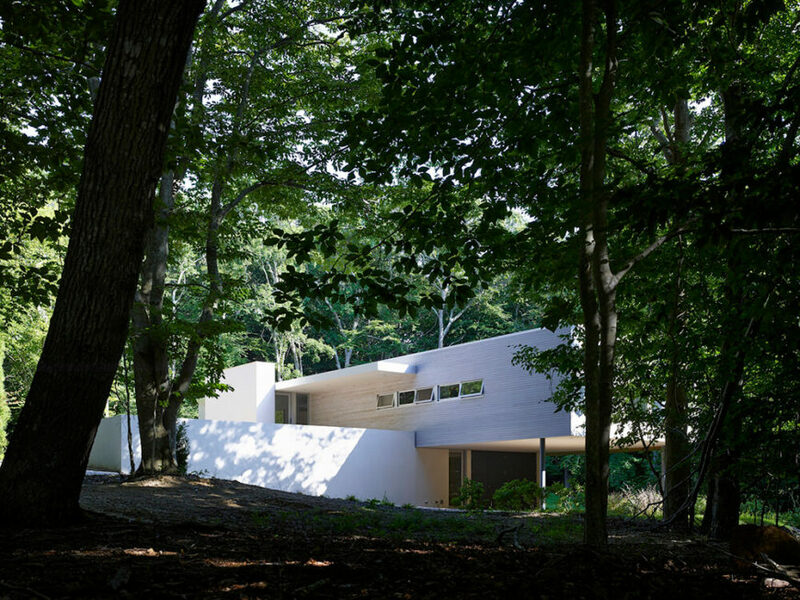 The structure appears to rise out of the landscape itself. Now we get to see the home at night, subtly glowing from within discreet openings along the facade. The warm lighting helps make the home approachable and open. 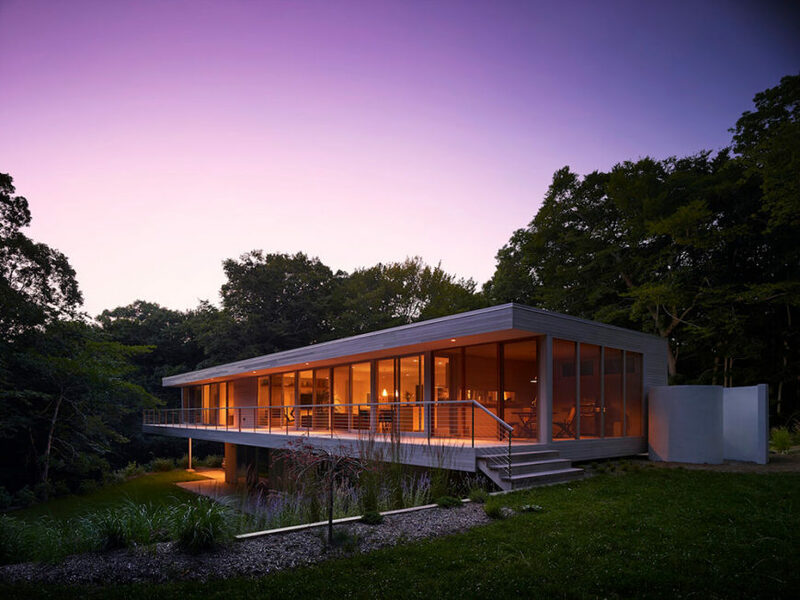 At dusk, we see the interior lit up from end to end through the structure-wide expanse of glass panels. 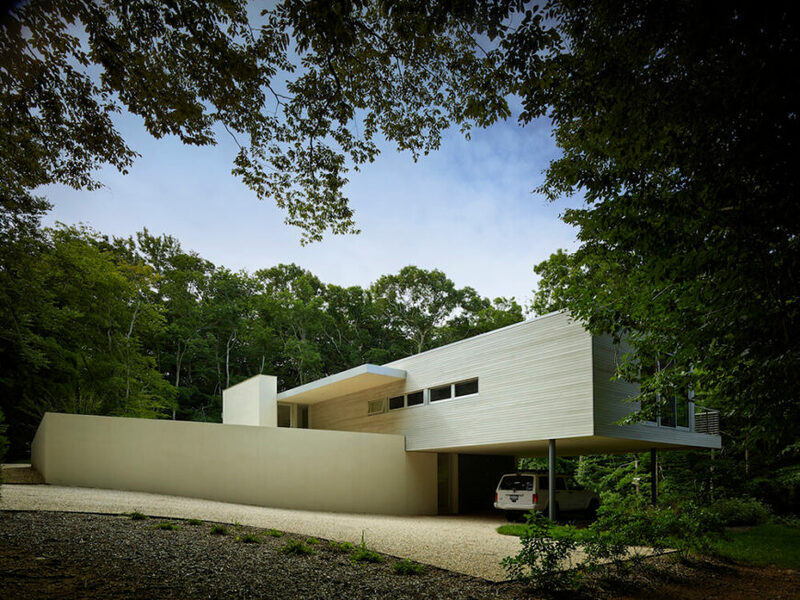 The house is truly meshed with its environment while standing out in sharp contrast.